Massachusetts Property Division Lawyer | Farias Family Law, P.C. 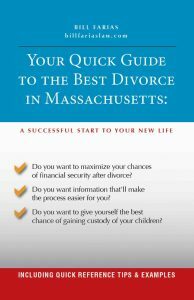 Massachusetts follows the popular “equitable division” approach to distributing property/money after divorce, which is governed by G.L. c. 208 sec. 34. The law’s goal is to distribute the property fairly, taking into account a number of factors bearing on the parties’ abilities to produce income and long-term financial prospects. Fault and gender were once significant considerations, but not anymore. The court now focuses on the economics and aims to keep the parties as close as possible to their standing of living during marriage. The larger the estate, and the greater one spouse’s financial dependence on the other, the more likely it is that there will be a long-term financial impact from the divorce, and the judge will consider that for division. Property division is the component of divorce for which it is most important to have quality representation. Judges have broad discretion in determining what property is classified as “marital property” for the division and what is “fair” division; so a skilled, aggressive Massachusetts Property Division Lawyer can be a difference-maker in your financial standing when you walk away from the divorce. To determine what property/money goes to whom, the judge must first determine what constitutes the “marital estate” – or marital property. In Massachusetts, the definition of marital property is broad and ever-expanding: it may include property acquired before marriage as well as during; and it also includes both tangible property such as houses and cars and intangible property, such as investments, portfolios, stock options, retirement, and timeshares. The judge can rule that the property stays with the sole title holder, can assign it to the other party, or order that it be sold to a third party for the proceeds to be divided. If there are children involved, their living arrangements likely will impact the judge’s decision. One of the more valuable assets in a marriage, they’re also subject to equitable division. IRA’s can be “rolled over” to the other party, and although social security benefits are technically part of the marital estate, judges may consider a party’s anticipated benefits when determining the division. Again, even property acquired before marriage may be “marital property.” The more contribution there is to the property’s value by the “non-owner” during the marriage, the more likely it is that the judge will consider it marital property, and include it in the marital estate. If acquired during the marriage, they may be ordered transferred to the other spouse. Also, in certain circumstances, trust assets can be used to satisfy payment. unvested stock options may be included in the marital estate for the division. Judges consider whether the stock option was given for effort before or during the marriage. judges can combine both parties’ debts and allocate the total debt equally; keep the respective debts with the responsible party, or do something in between. 1. neither party can sell, transfer, hide … etc. property. The parties may use their resources for “reasonable expenses of living,” “ordinary and usual course of business … [or] investing,” and litigation and attorney’s fees. However, for other transactions, they need either a written agreement by both parties or a court order. 3. absent agreement or court order, neither party can change the beneficiary of any life insurance, pension, retirement. 4. can’t cause the removal of other spouse or kids from existing medical, dental, life, auto, or disability insurance. Under G.L. c. 208 sec. 34, the judge has significant discretion in how to divide the property and considers a number of factors. The law is that there are some factors the judge must consider, and others the judge may consider (optional). However, many of them are overlapping and interrelated. the longer the marriage, and the greater the financial dependence of one spouse on the other, the more likely it is that the judge will order property and money transferred from one to the other. Also, the judge may consider the spouses’ contribution to the value of the property during marriage. Financial misconduct is likely to weigh heavily in the judge’s determination. Some examples are gambling, spending extended periods away from the home without producing income, stealing from a family business, and transferring assets in anticipation of divorce. In contrast, misconduct with little financial impact, such as adultery, matters little under the new equitable division laws. The courts focus on the finances. income, ability to meet needs, the potential for future earnings. If one parent sacrificed education and income to stay at home to tend to the children, the court is likely to take that into account. this is usually how custodial parent gets the home. judge considers the financial impact of these non-economic contributions. If one parent sacrificed education/income to be a homemaker, the court may consider that. Division of property for divorce is neither deductible by the payor nor taxable to the receiver as income. Although these are technically separate determinations that the judge makes, they’re interrelated. Alimony is an award by the court for support and maintenance from one spouse to the other. Absent an agreement by the parties, alimony merges with the divorce, and is, therefore, subject to modification in the future, at the request of either party, if there is a “material change in circumstance” (losing a job, illness affecting income). Property division, on the other hand, survives the judgment, and is not subject to modification: the judge’s decision on distribution is a final one. Although the judge makes a determination on each issue, the judge uses essentially the same factors to make both determinations, so for practical purposes, the property division affects the alimony and vice versa. It’s important to speak to an attorney as soon as possible to ensure that you’re taking the right steps to protect yourself. Also, you need a skilled litigator to get you what you’re entitled to. Contact Massachusetts Property Division Lawyer Bill Farias for a CONSULTATION at (508) 675-0464 or submit the contact form on this page. What are the Chances Alimony Will be Awarded in My Case? Will I Lose Half of My Business in Divorce?